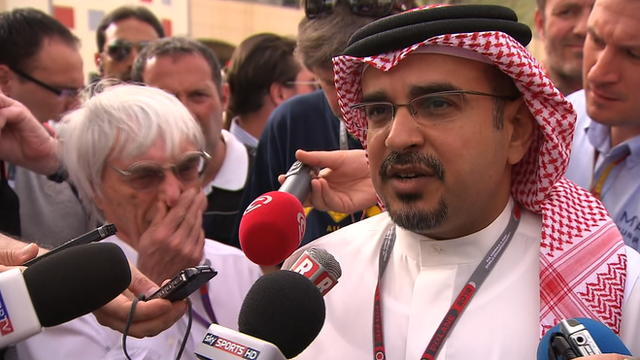 Bahrain crown prince Salman bin Hamad Al Khalifa says the weekend's grand prix will go ahead despite protests. Unrest in the Gulf state has led to calls for the race to be called off for the second year running. The Force India team missed Friday's second practice session as they wanted to return to their hotel before dark. On Thursday, a bus containing 12 mechanics from the Sauber team took to the hard shoulder after encountering a burning bottle in the road and seeing masked men running towards their lane but No-one was hurt in either incident. Several British politicians have called for the race to be cancelled while Amnesty International said "not much has changed" in Bahrain since last year's protests led to the deaths of more than 50 anti-government demonstrators. Prime minister David Cameron said it was a matter for Formula 1, but Labour leader Ed Milliband insisted it would send out the wrong signal if the grand prix went ahead at a time of protests over human rights abuses. However, Prince Salman said he thought the race could be "a force for good". The crown prince, flanked by F1 chief Bernie Ecclestone, gave a media briefing at the track.